The two episodes in this release were long thought to be missing from the BBC archive - but now they can be enjoyed in all their hilarious glory. The Blackboard Jungle sees Hancock playing a young English master, attempting to tame a class of unruly pupils. Can he win their respect - or will he be distracted by an attractive female teacher? In The New Secretary, Hancock decides his life is in a mess, so Sid suggests he get a secretary to organise him: ideally a blonde, Anita Ekberg lookalike. But they are both very surprised by who turns up... The master of misery is supported by a star cast including Sid James, Bill Kerr, Kenneth Williams and Hattie Jacques. 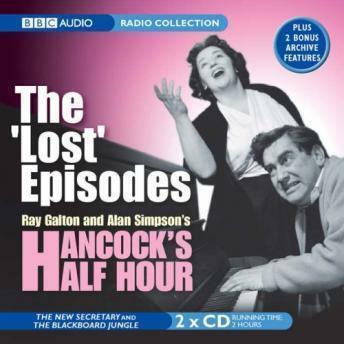 Also included are the bonus recordings: In Conversation With... Galton and Simpson from 2001, and Six Characters in Search of an Answer: Tony Hancock from 2003, which explores the character of Hancock in detail.